Enjoy the convenience of your own kitchen in all outdoor activities- Camping, Hunting, Fishing, R.V. Vacationing. Have a big canning project? Don't steam up your kitchen and overwork your air conditioner. Take your portable stove to a shady spot in the yard and make that big project a pleasure. All stoves may be used with propane or natural gas. Eureka! - We've found it! 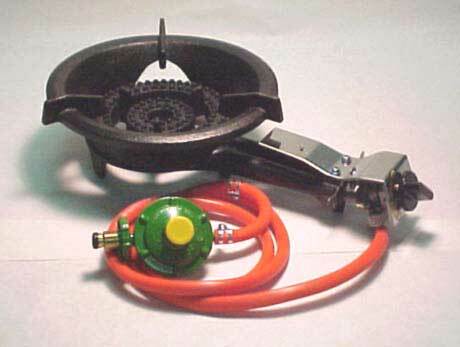 After years of searching, Embarcadero Cannery now offers the canner the most amazing dual output stove on the market. The10/20 offers the proud owner a choice of burner capacities from 10,000 to 20,000 BTUs for small to large pressure canners. Once you realize that your home stove has no more than 2,500 BTUs for the largest burner, you can see just how much more capacity the canner with the Embarcadero 10/20 commands. Fully portable, the 10/20 meets all canning and group cooking needs. It easily handles cooking and canning from 15 qt. up to 41 qt. commercial and even larger vessels. From home canning to a clambake, you can do it! The Embarcadero 10/20 comes complete with burners, stand, regulator and connecting hoses. It provides four levels of cooking or canning heat to give exacting control to the user. Operating on either propane or butane, it provides the utmost in culinary convenience for canners and large group cooking. The air to the flame can be controlled for the most effective combustion. It's uses in an emergency are legion! As a completely portable unit, the Embarcadero 10/20 can be used for feeding hot food to large numbers of people, sterilizing cooking and medical instruments and cloth and large quantities of water can be quickly purified by boiling. The 10/20 stoves were designed to be used by people without much education, so instructions for operation are amazingly simple and easy. The stoves are powerful, uncomplicated and absolutely a joy to use. Yet, the Embarcadero 10/20 can provide a small, very controlled flame for smaller cooking and canning jobs. Big or small, the Embarcadero 10/20 can do it all ! The Embarcadero 10/20 Dual Output Burner, with a full one year warranty, Contact us for the price. This picture also depicts Embarcadero Home Cannery's Patented Automatic Retort (pressure cooker) Cook Control Valve. This valve is so sensitive to changes in the surrounding environment, a person walking in the room will cause significant enough of a disturbance. Upon sensing the disturbance the valve will automatically vary the flame to compensate for the cooling effect. When the retort (pressure cooker) has achieved processing temperature this special valve will maintain the pressure and temperature inside the retort exactly. See chart below. Optimum gas consumption is an added benefit and under good conditions this unit uses approximately 25 BTU's per hour or the equivalent usage of the pilot flame.